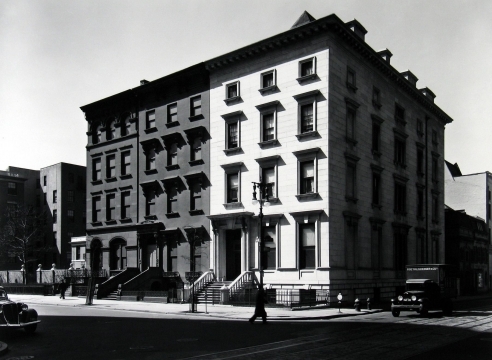 Berenice Abbott: Selections from "Changing New York"
Bookstein Projects is pleased to announce an exhibition of photographs by Berenice Abbott. This presentation will be composed of a selection of works from Abbott’s famed series: Changing New York. After returning to New York from Paris in 1929, Abbott witnessed the rapid transformation of the city on the eve of the Great Depression. Inspired by the changing landscape and equipped with an 8 x 10 format camera, she embarked upon a series of documentary photographs. From 1935 to 1939, with the help of the Federal Art Project of the Works Progress Administration, she photographed her famed series: Changing New York. The works were exhibited widely throughout the project and afterward, including a presentation at the Museum of the City of New York in 1937. It was both a critical and commercial success. The project culminated in a book published in 1939 in advance of the World’s Fair in Flushing Meadow, NY. It included some 97 illustrations and a text by the art critic, Elizabeth McCausland, who was also the artist’s life-partner. Berenice Abbott (b. 1898, Springfield, OH; d. 1991, Monson, ME) briefly attended the Ohio State University in 1917 to study Journalism. After dropping out, she began to study sculpture independently, moving to New York in 1918 and then Paris in 1921. Her first foray into photography was under the auspices of Man Ray who, in 1923, hired Abbott to be his studio assistant. After two years, she opened her own studio in Paris and began exhibiting her portraits with the likes of André Kertész, Man Ray and others at the First Independent Salon of Photography in 1928. In 1927, with the help of Julien Levy Gallery, Abbott purchased the bulk of Eugène Atget's photographic archive. She worked tirelessly to promote Atget’s work for the next forty years – printing from his negatives and reprinting old prints, organizing exhibitions, helping to publish books and facilitating sales of his work– before donating the collection to the Museum of Modern Art in 1984. Other notable presentations of the artist’s work include exhibitions at the Julien Levy Gallery, the Museum of the City of New York, The Museum of Modern Art, the International Center of Photography, the Jeu de Paume, Paris, and the Martin-Gropius-Bau, Berlin. Abbott’s work is held in the collections of the New York Public Library, the Museum of the City of New York, The Jewish Museum of New York, the Smithsonian American Art Museum, The Phillips Collection in Washington D.C., the Minneapolis Institute of Art, and the Cleveland Museum of Art, among others. A biography of Berenice Abbot entitled, A Life in Photography, by Julia Van Haaften was published by W.W. Norton & Company earlier this year. Berenice Abbott: Selections from "Changing New York" will be on view from June 6 – July 27, 2018. A reception will be held on Thursday, June 14th from 6:00 – 8:00 pm. Gallery hours are Monday through Friday, 11:00 am to 6:00 pm. For additional information and/or visual materials, please contact the gallery at (212) – 750 – 0949 or by email at info@booksteinprojects.com.